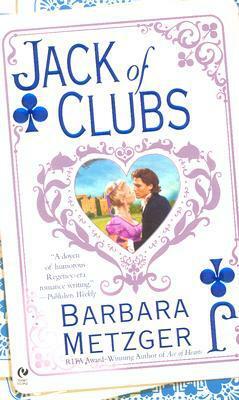 Barbara Metzger deals a winning hand in her second House of Cards novel . . . in which a man determined to find his lost sibling learns that sometimes even the most desperate bluff can reap the greatest reward. . . .
Years ago, Captain Jack Endicott's young half sister vanished after a carriage accident. Now, hardened by fighting in the Peninsular wars, Jack sets out to honor his father's dying wish that he find the missing girl. Disdainful of "proper" gentlemanly pursuits and refusing to live off his noble brother, Jack makes a bold play. He'll open a lavish gaming parlor in London--and, by hiring only beautiful ladies to deal cards, possibly find his sister. All he needs is a little luck. Schoolteacher Allison Silver is at her wit's end. After an arduous journey escorting a precocious pupil to her grandparents in London, the old folks are not even home to take delivery! And the only possible alternate guardian is a known womanizer who runs a gambling house, of all things.